Lunar and solar tide interaction Around new or full moon, the lunar and solar tidal effects reinforce each other, leading to a larger than average tidal range. 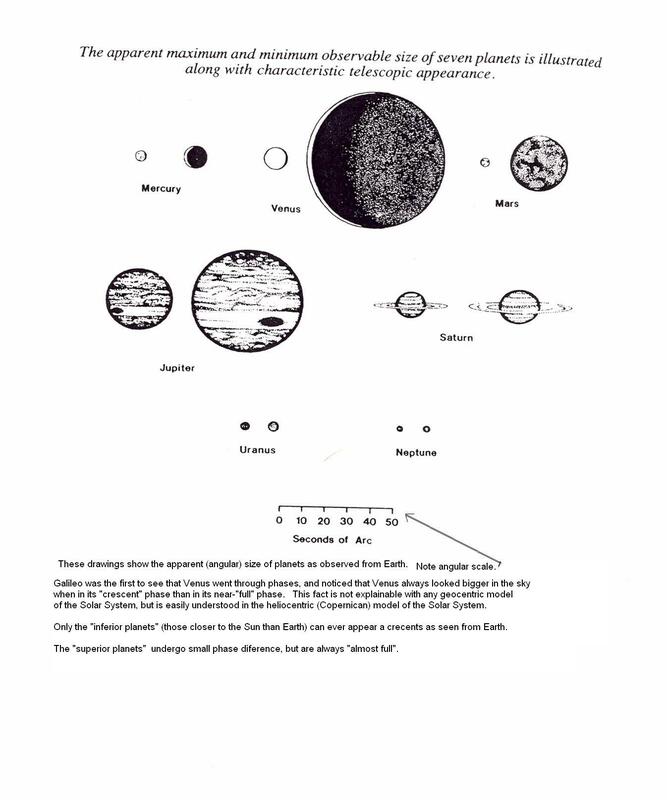 Around first and third quarter moons, the solar and lunar tidal effects partially cancel each other. 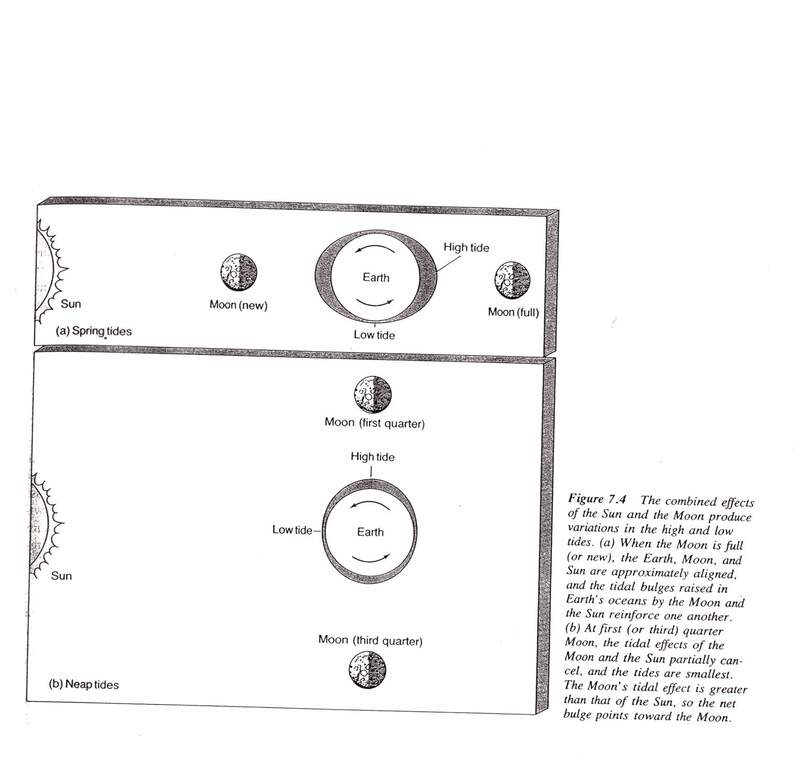 As the lunar tides are about twice the effect of the solar, the lunar tide "wins" and the tide point (almost) at the moon, rather than at the Sun. Tides for a month You can easily see the high and low tide cycle and the monthly lunar/solar interaction change in tidal range. Tidal bulge of Earth leading Moon As the Earth spins in less time than the orbital period of the Moon, the Earth tries to drag the tidal bulge around faster than the Moon. 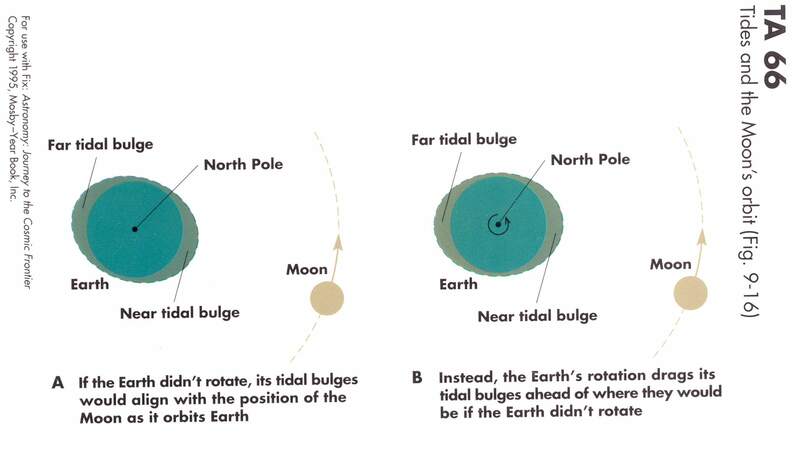 The tidal bulge nearer the Moon pulls the Moon slightly more than the far bulge, resulting in a torque on the Moon. This torque increases the *orbital* angular momemtum of the Moon, as the expense of the *spin* angular momemtum of Earth. 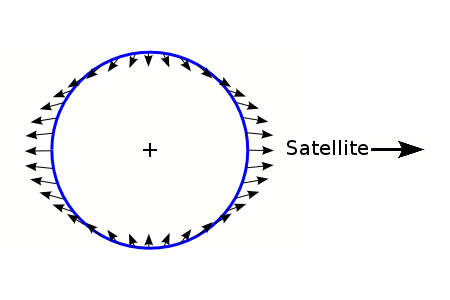 The Earth-Moon system is essentially isolated for purposes of angular momentum (no external torques) so the system angular momemtum must be conserved. Tides around new/full moon are called "spring tides" while quarter moon tides are called "neap tides". "Spring tides" have nothing to do with the season. 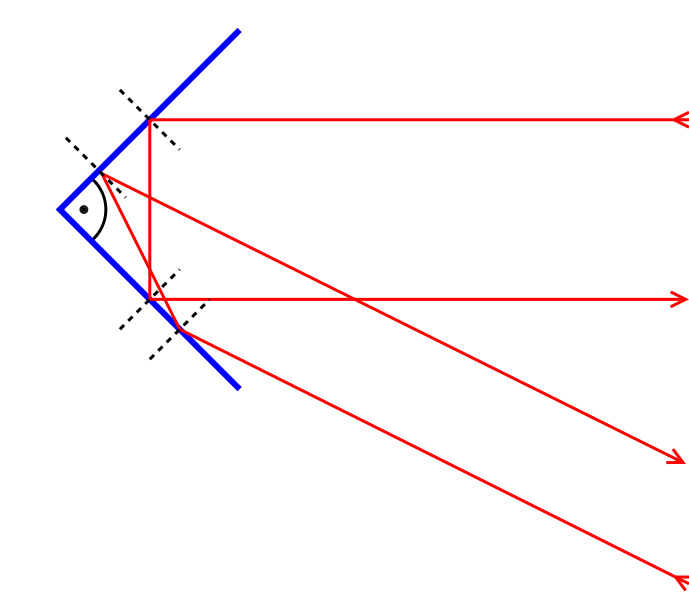 Corner reflector A corner reflector (here in 2dim- real ones are in 3dim of course) returns light rays in a direction *parallel* to the incident direction, unlike a flat mirror, where the angle of incidence equals the angle of reflection. 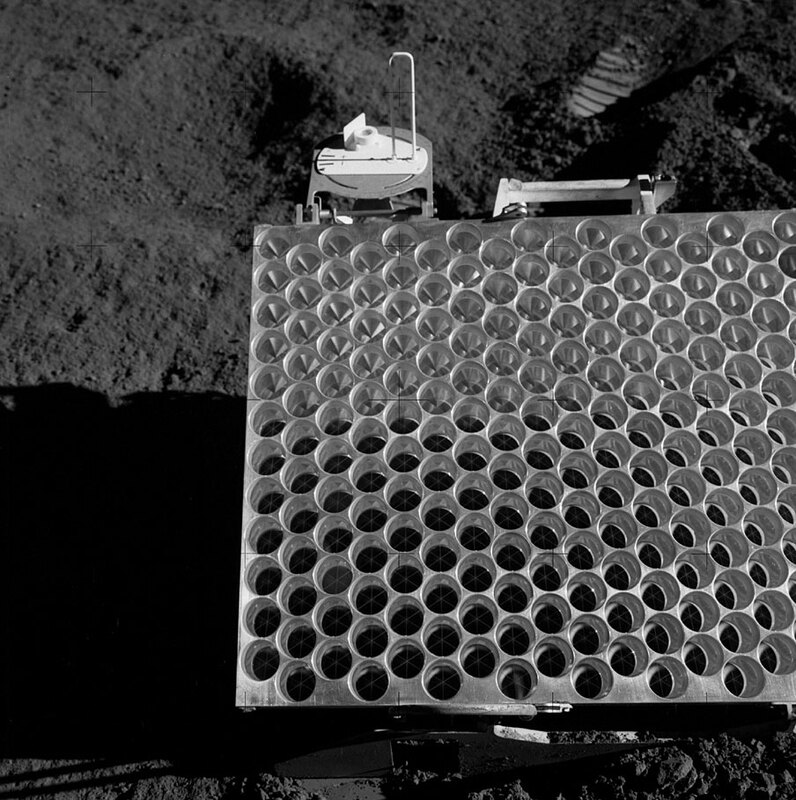 Lunar corner reflector array Apollo astronauts and Russian robotic lunar landers have left several corner refectors on the Lunar surface. 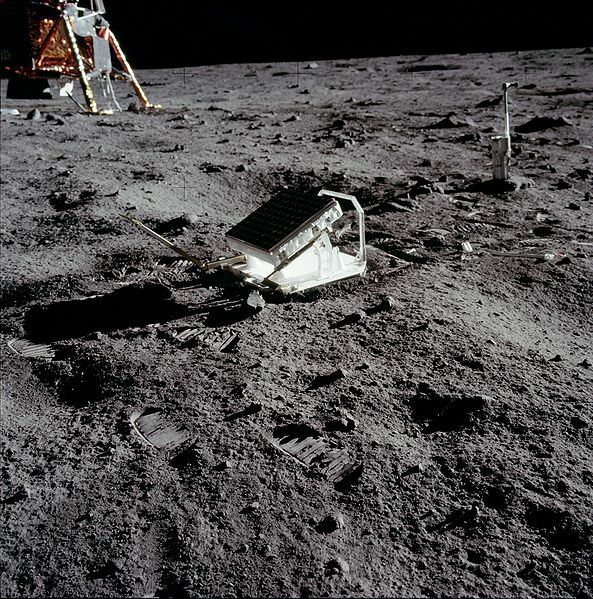 By shooting laser beams at these, and measuring the time to get an "echo" precise measurements of the Earth- Moon distance have been made for the past 40 years. Detail of lunar corner reflector Looking like a thing for the astronauts to store their empty soda bottles in, each "hole" is actually a glass corner reflector like the one I passed around in class. These reflect laser beams sent through a telescope from Earth directly back to that telescope. 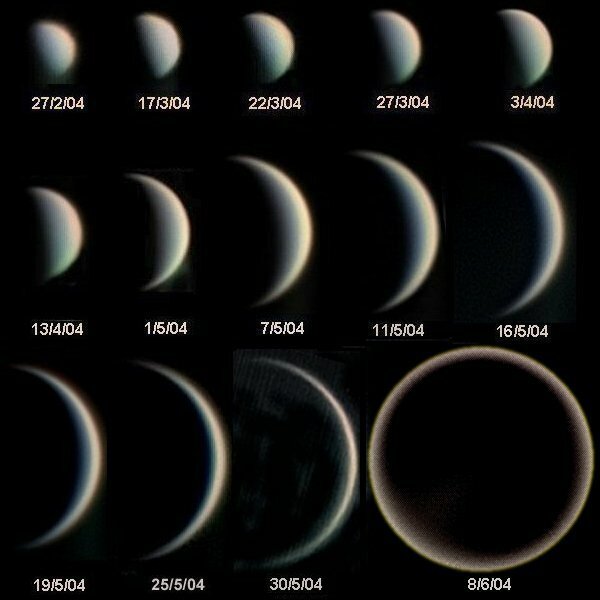 Phases of Venus The changing appearance of Venus over a 4 month period in 2004. The last image shows a "new" Venus, when Venus is almost between us and the Sun. (Venus was less than a degree from Sun on that date!) The ring of light comes from light refracted through the atmosphere of Venus.